What does lump sum mean in the context of relocation? A lump sum is a set amount of money given to an employee or new hire for relocation. The money is intended to help them move to their new job location. The lump-sum amount varies depending on the company, employee level, or any number of other factors. While lump sums sound easy for the employer, they can cause some serious issues. In fact, lump sums can often be more problematic than the alternatives. The income tax bite: Nobody likes taxes. Yet, a relocation lump-sum payment is treated the same as a bonus. It’s immediately considered taxable income to the employee. As the employer, you must withhold state and federal taxes and pay social security taxes. The cost-control dilemma: Ironically, the lump-sum approach was created to ensure cost control, but it’s actually not very successful in doing so. In some cases, the lump sum covers more than the actual costs. This means the company spent more than it had to on the move. Often, though, an employee has more relocation expenses than their after-tax lump sum covers. It’s difficult to refuse a valuable employee if they ask for more money in the middle of a move. The time-commitment conundrum: Relocation involves a lot of moving pieces. Moving companies, real estate, temporary housing — it can be overwhelming. How long will managing it all take? How much time should your employees invest in these activities? And what if they make mistakes along the way? The negative employee experience: The idea of saving some of the lump-sum money might appeal to some employees. They may decide to rent a self-haul truck or sell their home without using a realtor. Relocation is one of the more stressful events your employee will ever experience, and a lump-sum approach can cause them to have a poor experience. The accountability inevitability: When things go sideways with a relocation lump sum, who are managers going to turn to fix things? That’s right: you. It will be up to you to resolve the problems that lump sums create. Lump sums may seem like the simple solution. But in the end, they can be costly, complex, and negative for the employee. There’s a new alternative to lump-sum programs, called NuCompass CoPilot. It's for companies that want some of the advantages of lump sums, without all the disadvantages. CoPilot is a cloud-based, easy-to-use relocation platform that helps you relocate your new and current employees affordably and effectively. 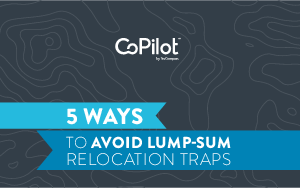 Read the full e-book today to learn more about the challenges that companies face when they use lump-sum programs to relocate employees and how CoPilot can help.